Part of the enjoyment of hiking or nature walking is checking for signs of the local wildlife. If you look carefully – or sometimes, it will be fairly obvious – you can see signs of what animals have been in the area. Usually the largest animals I spot while hiking here in New Jersey tend to be other humans. But in most of the parks and hiking areas around here, you’ll spot some deer, lots of birds, lots of squirrels and chipmunks, a few snakes, and maybe a fox or a black bear. A couple of times, I’ve come out to my car in the morning to head off to work, and noticed some distinct, muddy footprints, about the size of a cat’s but with very different toes, on my car’s hood. The raccoons have been by again, I say to myself. In most hiking areas, you’ll always find prints from lots of other hikers, often with dogs of varying sizes in tow – from terriers and toy dogs up to shepherds, setters and retrievers. With the humans, you can maybe tell who’s wearing sneakers and who’s shelled out the big bucks for expensive boots. But on trails that see a lot of foot traffic, eventually everyone’s prints get muddied together. Occasionally, you’ll find a mountain bike tread as well – never mind that bikes generally aren’t allowed on hiking trails. 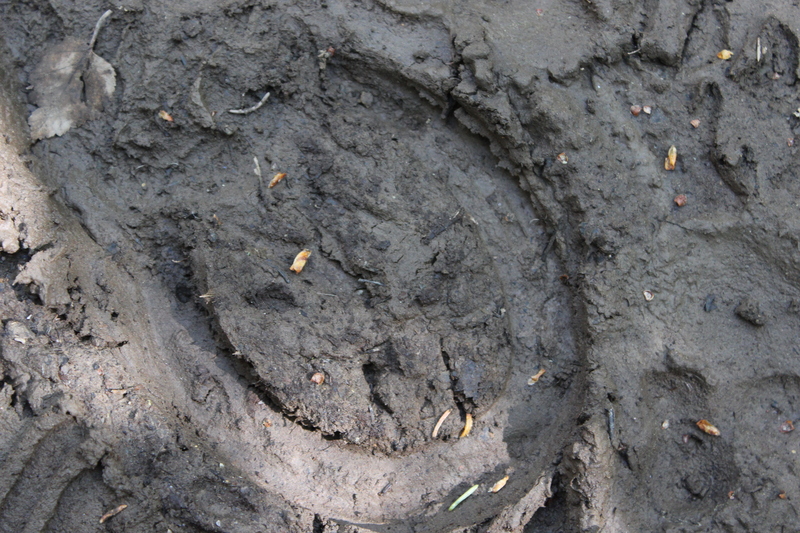 In parks with designated bridle trails, you’re almost certain to spot some horse prints. On a recent jaunt along the Long Path in the Palisades, I found myself noticing lots of deer prints. It’s not surprising, of course – you see deer up along the Long Path from time to time. And the prints were all of different sizes – so it seems as if whole families of deer were out, adults with fawns in tow. There might be some stray feathers – gray might mean a robin, red or brown for a cardinal, steel blue for a blue jay. There are a lot of guided nature walks where the guide will teach you how to recognize owl pellets or “castings:” the remains of whatever the owl recently ate, like mice or other small rodents, and expelled from the owl’s system. 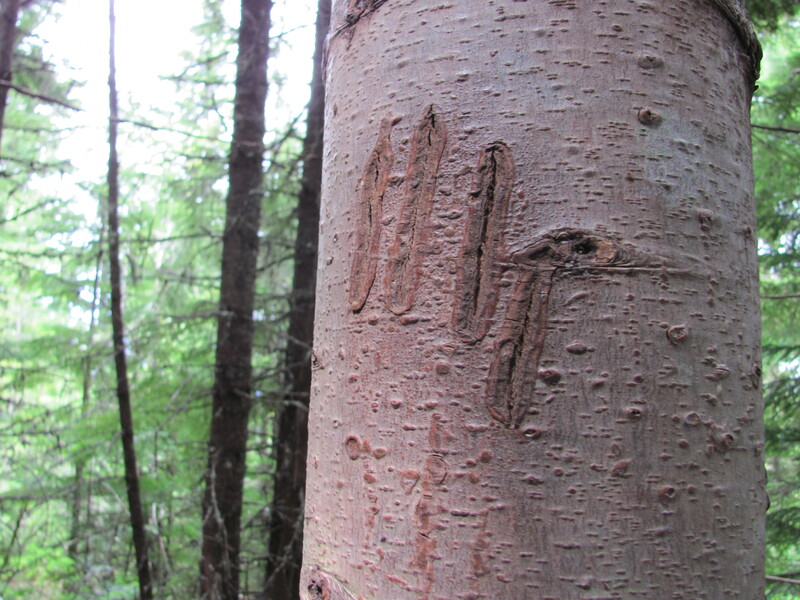 In addition to what’s on the ground, it pays to check out the trees as well; while we were doing a combined hike and zipline course up in British Columbia a few years ago, one of the guides pointed out a tree that a bear had used as a scratching post a while back. There were four parallel claw marks in the bark of the tree; not fresh ones, since the bark and the cambium layer had started to heal over. And in parts of North America where the moose tends to live, a birch tree with shredded bark could mean that a moose has just been along to do lunch. There are a number of guidebooks and websites out there that show how to identify common mammal prints and other natural signs; some sites include The Old Farmer’s Almanac and Alderleaf Wilderness College.